Twin Cities Carry Forum Archive • View topic - What's in season? Post subject: What's in season? A friend of mine wants to try out hunting small game. I haven't done much of it myself, but it seems like there isn't much open to shoot this time of year. So, what is in season? Nothing is in season that I can see. Yea, I didn't see anything "in season" on DNR's site either. So what doesn't have a season? Coyotes? Pigeons? Unprotected Animals is the term the DNR uses. Residents and nonresidents are not required to have a license to take unprotected species including coyote. Nonresidents do not need a furbearer hunting license in addition to their small game license to hunt fox. Weasels, coyotes, gophers, porcupines, striped skunks, and all other mammals for which there are no closed seasons or other protection are unprotected animals. They may be taken in any manner, except with the aid of artificial lights or by using a motor vehicle to drive, chase, run over, or kill the animal. Poisons may not be used except in accordance with all label regulations of the state Dept. of Agriculture and federal environmental Protection Agency. House sparrows, starlings, common pigeons, chukar partridge, quail other than northern bobwhite, and monk parakeets are unprotected and may be taken at any time. Now, if we could get them to allow hunting of squirrels in MPLS, life would be good. That "monk parakeet" thing always makes me laugh. How many wild parakeets do you guys see flying around Minnesota? I've never seen a one. 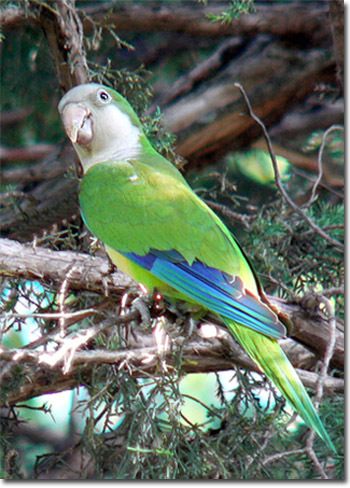 Wow, I didn't know what a "monk parakeet" was, so I googled it. I SWEAR I saw one of these in my backyard and on my deck last week. Turns out I could have shot it... damn. If you trapped such a bird, you could probably sell it. Awwwww..... It's so cute! How could you shoot one? My Uncle who was the first to take me hunting when I was a kid taught me never to hunt anything that I wasn't going to eat. Of course, varminting wasn't considered real hunting. It was "extermination". Never miss an opportunity to go out and chase yotes. As often as not, they don't get the memo that they're supposed to (1) show up , and (2) fall down when I get the glass on 'em. Judge, jury, and anything else I need to be. This is a great time of the year to eliminate skunks, porcupines, and feral cats. The skunks and cats do a terrific job of lowering our game bird population! Porcupines are easily spotted here 'up nort' now before the leaves all set on. BTW the 124+p Hydrashok's do a great job on porcupines. I've gotten two in three weeks! Loads of fun! Wait a minute... This is MN! Didn't you get the memo - fishing season opens at midnight! Carry a good rifle in the boat in case of Jaws!